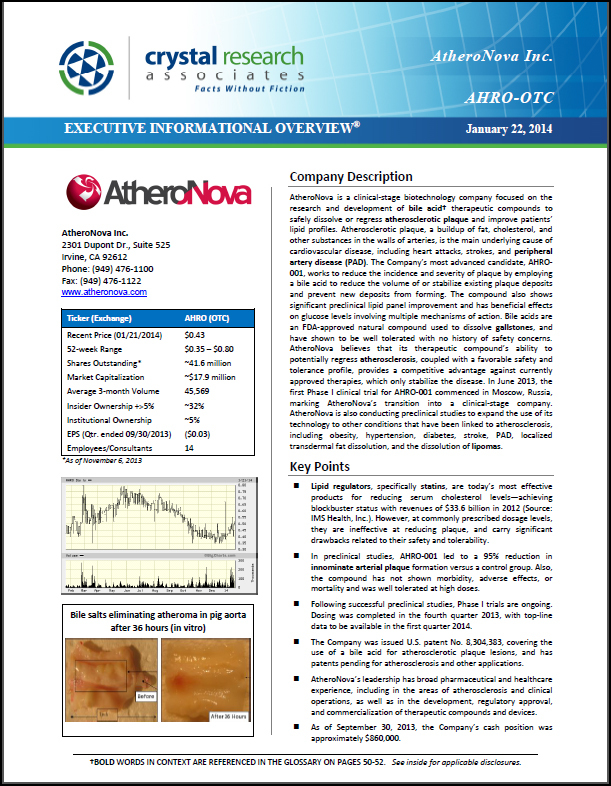 We released a new report today--an Updated Executive Informational Overview--on AtheroNova Inc. (AHRO-OTC). AtheroNova is a clinical-stage biotechnology company focused on the research and development of bile acid therapeutic compounds to safely dissolve or regress atherosclerotic plaque and improve patients’ lipid profiles. Atherosclerotic plaque, a buildup of fat, cholesterol, and other substances in the walls of arteries, is the main underlying cause of cardiovascular disease, including heart attacks, strokes, and peripheral artery disease (PAD). The Company’s most advanced candidate, AHRO-001, works to reduce the incidence and severity of plaque by employing a bile acid to reduce the volume of or stabilize existing plaque deposits and prevent new deposits from forming. The compound also shows significant preclinical lipid panel improvement and has beneficial effects on glucose levels involving multiple mechanisms of action. AtheroNova Inc. announced today a significant milestone in completing the active treatment portion of its Phase 1 clinical trial with its lead compound, AHRO-001. The objective of the Phase I study is to evaluate AHRO-001’s safety, tolerability, and pharmacokinetics in volunteers who are healthy. This clinical study is being conducted in Russia with AtheroNova's licensing partner, OOO CardioNova. The design of the Phase 1 study is to characterize the safety of AHRO-001 through three dose ranges and possible pharmacokinetics, with a planned enrollment of 54 subjects. This multi-center, randomized, double-blind, placebo-controlled, single and multiple dose escalation, is the first-in-human study of AHRO-001 administered via oral tablet to healthy adult volunteers at sites in Moscow and St. Petersburg, Russia. All subjects have been dosed and received either placebo or AHRO-001 in doses ranging from 18.75 mg/kg to 37.5 mg/kg per day. Top line data is expected to be announced in the first quarter of 2014. 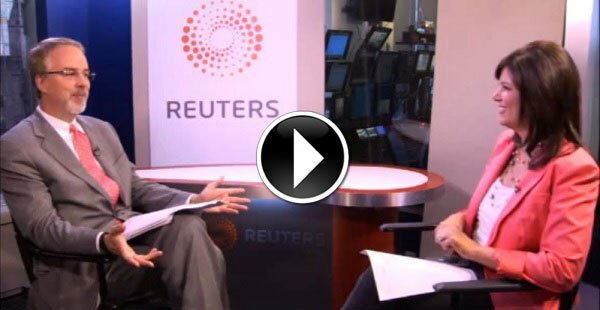 Last week, Jeff Kraws sat down with Rhonda Schaffler at Reuters to discuss opportunities and trends in the biotech space. Mr. Kraws is a veteran Wall Street sell-side analyst with more than 20 years of experience and is also cofounder and CEO of Crystal Research Associates. If you enjoyed the short clip of this interview released earlier this week, the full segment (available below) goes into more detail on individual biotech stocks and the events every investor should be watching out for. An article published last week on FierceBiotech described Russia's current biotech focus and the opportunities this may hold for U.S. companies. Over the past year or so, Russia has been increasingly focused on biotechnology companies as a way to diversify its $1.9 trillion economy. In particular, Russia's OAO Rusnano (formerly the state-owned Russion Corporation of Nanotechnologies, which was transitioned into Rusnano in President Vladimir Putin's second term) has purchased stakes in R&D companies from Europe, Israel, and the U.S. Such investments often require the transfer of technologies to Russia or are accompanied by the establishment of Russian-based laboratories, scientists, and patent rights, as noted in an article from BloombergBusinessweek. Today, AtheroNova Inc. (AHRO-OTC) announced that it has initiated a Phase I clinical trial with AHRO-001, the Company’s lead compound. This milestone marks AtheroNova’s transition to a clinical-stage company. AHRO-001 is intended to treat and prevent atherosclerosis, a disease in which the buildup of cholesterol, fats, or other fatty substances along the walls of the arteries causes thickening, blockage, and hardening. Atherosclerotic plaque is the main cause of cardiovascular disease. Currently, lipid regulators, specifically statins, are the most effective method for reducing serum cholesterol levels. However, at commonly prescribed dosage levels, statins are ineffective at reducing plaque, carry significant drawbacks in their tolerability, and may pose complications resulting from long-term use. Despite these disadvantages, the global market for lipid regulators was $38.7 billion as of 2011 (Source: IMS Health). Yesterday, AtheroNova Inc. (AHRO-OTC) announced a major milestone in the Company's progression to Phase I clinical trials. AtheroNova has now shipped Phase I supplies of AHRO-001, the Company's lead drug candidate fighting atherosclerotic plaque, to CardioNova, the Company's Russian licensing partner. This shipment was the last major step to commencing human trials, and indicates that AtheroNova is on track to start patient screenings and first-in-man dosing in June 2013. This morning, AtheroNova Inc. (AHRO-OTC) announced that it expanded its clinical expertise by adding Dr. Stephen Nicholls as Chair of the Company's Clinical Advisory Board. AtheroNova expects to launch its first Phase I clinical trial in the next few months for a drug called AHRO-001 to combat the accumulation of plaque in the arteries, thus the appointment of Dr. Nicholls--who has completed a postdoctoral fellowship in plaque imaging at the Cleveland Clinic and is the current heart disease Theme Leader at the South Australia Health and Medical Research Institute--is extremely well-timed. Dr. Nicholls will serve as a co-principal investigator in the upcoming clinical trial. NEW RESEARCH: Quarterly Update on AtheroNova Inc. Crystal Research Associates has released a Quarterly Update on AtheroNova Inc., a biotechnology company focused on the research and development of compounds that safely regress atherosclerotic plaque and improve patients’ lipid profiles. The 12-page report is available here. Atherosclerotic plaque is a buildup of fat, cholesterol, and other substances. These plaque deposits, which progressively narrow and block the arteries, are the main underlying cause of cardiovascular disease, including heart attack, stroke, and peripheral artery disease (PAD). This morning, we issued a Quarterly Update on AtheroNova Inc. (AHRO-OTC.BB), a development-stage biotech company creating novel compounds to dissolve or regress atherosclerotic plaque deposits. AtheroNova's most advanced product candidate, AHRO-001, works to significantly reduce the incidence and severity of plaque by employing a type of FDA-approved compound called a bile salt. In doing so, the Company seeks to address a +$37 billion market for lipid regulators--the drugs currently used to treat atherosclerosis and coronary artery disease. Atherosclerosis is a thickening of the arteries that occurs when fat, cholesterol, and other substances build up in the walls of the arteries and harden into plaque deposits. It is the primary cause of many cardiovascular diseases, including heart attack, stroke, and peripheral artery disease. Biotech company AtheroNova Inc. (AHRO-OTC) this morning announced that it raised over $2.9 million in gross proceeds from a sale of its Common Stock. This funding represents a major milestone for the company, as it is expected to support both Phase I and Phase II clinical trials for AtheroNova's anti-atherosclerotic plaque compounds in development. AtheroNova's most advanced product candidate, AHRO-001, works to significantly reduce the incidence and severity of plaque deposits, which are known to be the main underlying cause of cardiovascular disease, including heart attack, stroke, and peripheral artery disease (PAD). Novel biotech company AtheroNova Inc. (AHRO-OTC) made a significant news announcement last week when it reported the receipt of a Notice of Allowance from the U.S. Patent and Trademark Office (USPTO) for its main patent. The Notice of Allowance entailed written communication from the USPTO to AtheroNova that the Company’s primary patent was allowable. A Notice of Allowance specifies the amount of issue and/or publication fees that are due within three months in order to avoid abandonment of the applications (Source: USPTO). Accordingly, AtheroNova expects to announce the official patent issuance within the next few months once the registration process is complete. New research available in our library at www.crystalra.com gives readers a complete description of the business of AtheroNova: its product development, milestones, competitive pressures, market opportunities, risks, and more. A 52-page report is available here, with future Quarterly Updates coming as AtheroNova advances this year.